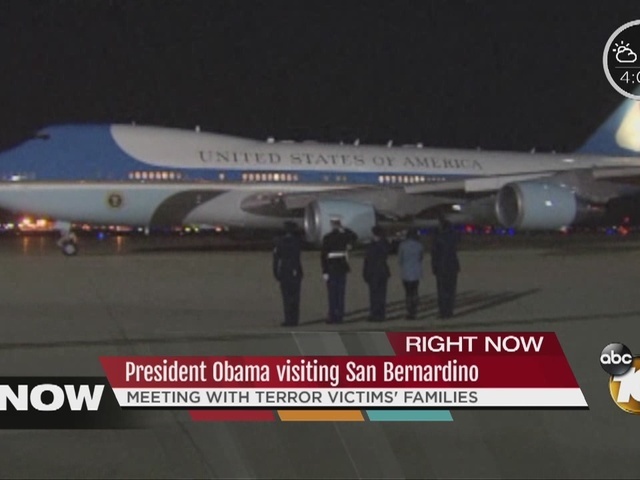 WASHINGTON -- President Barack Obama is opening his Christmas vacation on a somber note: meeting with families of the 14 people who were killed in the San Bernardino shooting . Obama was to stop in California en route to Hawaii on Friday for his annual holiday getaway. Obama's wife, Michelle, was joining him for the meetings. The Islamic State group has claimed responsibility for the Nov. 13 attack in Paris that killed 130 people. Both attacks, coming days apart and just before the start of the holiday season, heightened public fears about future attacks on U.S. soil. Obama has tried to allay those concerns with a rare Oval Office address, days after the San Bernardino attack, on the administration's strategy to counter the threat from IS, as well as through public appearances this week with members of his national security team following separate briefings he received on the Islamic State and potential threats to the homeland. Obama was flying to California after holding an end-of-year news conference at the White House. After meeting with the families, he planned to continue to Hawaii to begin two weeks of vacation with his wife and daughters in the island state where he was born. He is scheduled to return to the White House in early January to begin his final year in office.